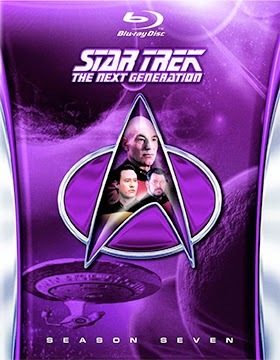 Paramount Home Media boldly goes to the ends of the universe with the farewell season of Star Trek: The Next Generation Season 7 as a six-disc Blu-ray product offering on Dec. 2. 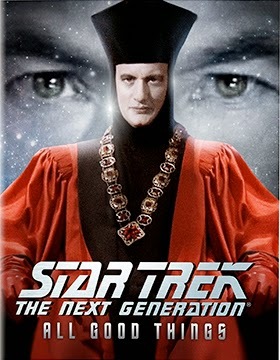 Also heading landing on Blu-ray is the feature-length presentation of the sign-off to Star Trek: The Next Generation – All Good Things …, which features Q (John de Lancie) once again as the omnipotent judge of Q Continuum and Picard (Patrick Stewart) inexplicably jumping between the past, the future and the present. The fate of universe, and certainly the survival of the crew of the Enterprise, may hang in the balance. Bonus nuggets include commentary by writers Ronald D. Moore and Brannon Braga, a half-dozen deleted scenes and the featurette titled, “The Unknown Possibilities of Existence: Making "All Good Things … ." Also on the way from Paramount (in chronological order) are the following new release calendar additions. Added to the Nov. 11 DVD selections is writer/director Joe Swanberg’s surprise Grand Jury Prize nominee at this year’s Sundance Film Festival, Happy Christmas. The film worked the festival circuit and had a brief theatrical showcase before making its way to the home entertainment market place. For the record the ARR works out to 109 days. Jenny (Anna Kendrick — Oscar nominee for Best Supporting Actress in Up in the Air) has a messy breakup and ends up moving in with her older brother, Kevin (Mark Webber — Scott Pilgrim vs. the World, The Ever After, etc. ), his wife Kelly (Melanie Lynskey — Up in the Air, Away We Go, Foreign Correspondents, etc.) and their young son with disastrous results. The limits of “family” will be tested!!! Shifting to Nov. 25, Comedy Central’s hilarious Drunk History (based on the “Funny or Die” webisode series will be hitting the streets as a three-disc DVD collection titled Drunk History: Season One & Two (all 18 episodes). Dec. 2 sees DVD and Blu-ray SKUs for the anime series, Legend of Korra: Book Three – Change, TV-on-DVD selections that include Bonanza: The Official Eighth Season, Volume One and Bonanza: The Official Eighth Season, Volume Two (both four-disc SKUs) and three more Perry Mason Movie Collection Double Features. 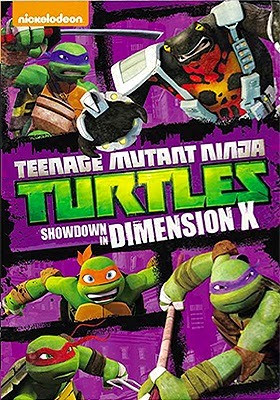 Lastly, Dec. 2 is also the street date for the double-disc DVD release of Nickelodeon’s Teenage Mutant Ninja Turtles: Showdown in Dimension X, a 12-episode selection of non-stop action adventures. Eagle Rock Entertainment has been busy restoring filmmaker Stuart Orme’s 1981 film, Three Sides Live, from the original 16mm film elements … and now it’s ready for a DVD and Blu-ray push on Nov. 4. 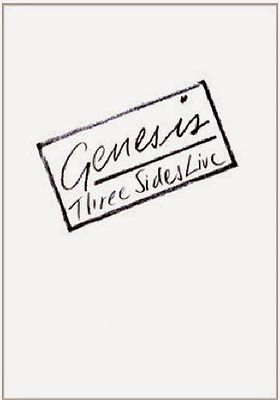 Titled for release as Genesis: Three Side Live, this film presentations blends live concert footage from Genesis’ 1981 “Abacab” world tour (filmed at the Nassau Coliseum in Uniondale, New York) with extensive interviews with the group’s members, plus behind-the-scenes tour footage. In a land of over 300 million people you can find some pretty odd obsessions. That probably goes without saying, but actor-turned-documentary filmmaker Tommy Avallone has found one “calling” that can be all-things from funny to sad, to passionate or just plain whimsical. Mall Santas, as we discover, come from all walks of life. 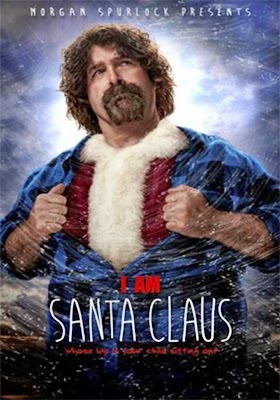 From WWE super star Mick Foley to the likes of Russell Spice, who got so caught up in the persona of being Santa Claus that he destroyed his married, lost his home and only snaps out of his year-long bouts of depression when he dons the suit and hears the Christmas wishes of others. In I Am Santa Claus you learn that there are factions, political groups, competing organizations and even one fellow (and probably more) who has legally changed his name to Santa Claus!!! Always fascinating! Yes, they mow their lawns in the summer, go about their hum-drum jobs throughout the year, but there is always one eye on the calendar for that special time of the year when they can be Santa! 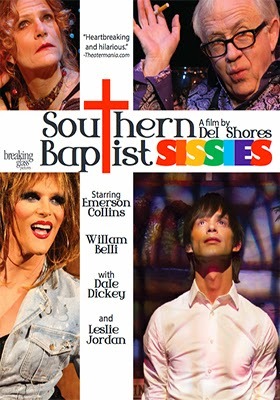 Breaking Glass Pictures has tabbed Nov. 11 for the DVD debut of acclaimed writer/director Del Shores’ clever mix of a stage-and-film presentation of his Southern Baptist Sissies stage play. He could have simply shot a straight-on version of his play (Tyler Perry has been cranking’em out left and right), but Shores takes us from the moribund confines of the stage, complete with audiences, to any empty theatre periodically and in doing so breaks the pane of the stage play construct. This use of the film process moves his four protagonists from simply being characters to real people (think: Shakespeare’s As You Like It, “All the world‘s a stage, and all the men and women merely players”). 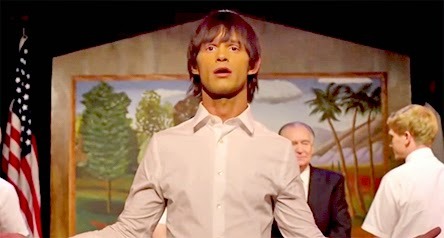 Chief among the “story tellers” is Mark (Emerson Collins — as Max in Del Shores’ Sordid Lives: The Series), who provides the opening monologue and pretty much sums up his frustration, anger and loneliness over being raised a Southern Baptist and yet ostracized, not for anything he has done, but for what he is, gay. Southern Baptist Sissies is drenched in irony, in that the four protagonists feel trapped in where they are in their lives … a need for a loving God; the words and deeds of Jesus are very much a part of their make-up. And yet, there is that anger. Ultimately Shores moves through this and ends on a positive message. If only the real world were so hopeful. Bonus goodies include a pair of music videos — “Stained Glass Window” and “Pass Me Not” — a behind-the-scenes production featurette and newly-prepared cast interviews. HBO Home Entertainment packs a wallop in November with the final season of True Blood, the second installment of Newsroom and the debut of the cable sitcom, Getting On. First up on Nov. 4 are three-disc sets of both DVD and Blu-ray SKUs for The Newsroom: The Complete Second Season. Bonus features here include selected episode commentaries from series creator Aaron Sorkin and cast members that include Jeff Daniels, Sam Waterston, Emily Mortimer and Olivia Munn and deleted scenes. 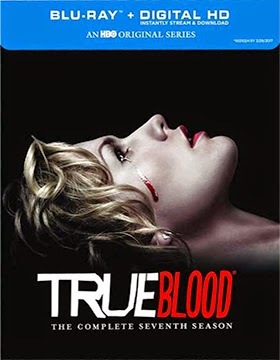 The following week, Nov. 11, True Blood: The Complete Seventh Season will be available on both DVD and Blu-ray (with UltraViolet) as four-disc product offerings (plus, there will full-series collections issued on that date as well). Lastly, Nov. 11 also marks the debut of the American cable version of the popular Brit TV series, Getting On: The Complete First Season. DVD and Blu-ray editions will be made available … bonus nuggets include a gag reel and deleted scenes. On the 11th day of the 11th month there will be an 11-film collection of the famed Japanese Gamera flying turtle creature making its way to the Blu-ray market place courtesy of Mill Creek Entertainment. 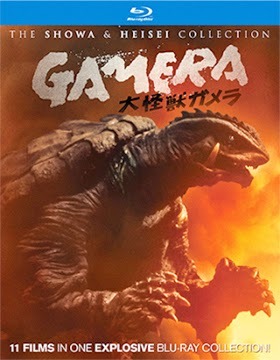 Titled Gamera: The Showa & Heisei Collection, this four-disc collection includes the director Noriaki Yuasa’s (aka: Kenji Yuasa) original 1965 film, Gamera: The Giant Monster, plus director Shigeo Tanaka’s 1966 follow-up, Gamera vs. Barugon. The other nine films included this genre-fan collectible are: Gamera vs. Gyaos (1967), Gamera vs. Viras (1968), Gamera vs. Guiron (1969), Gamera vs. Jiger (1970), Gamera vs. Zigra (1971), Gamera: Super Monster (1980), Gamera: Guardian of the Universe (1995), Gamera 2: Attack of Legion (1996) and Gamera 3: Revenge of Iris (1999). 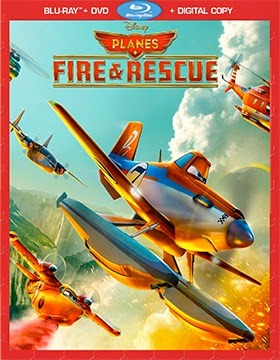 Director Roberts Gannaway’s Planes: Fire & Rescue will be joining Maleficent on Nov. 4 as both DVD and Blu-ray/DVD Combo Pack (with Digital Copy) product offerings. The ARR comes in at 109 days and summer ticket sales were a lackluster $58.2 million, which will likely make this spin-off franchise going a direct-to-video affair.